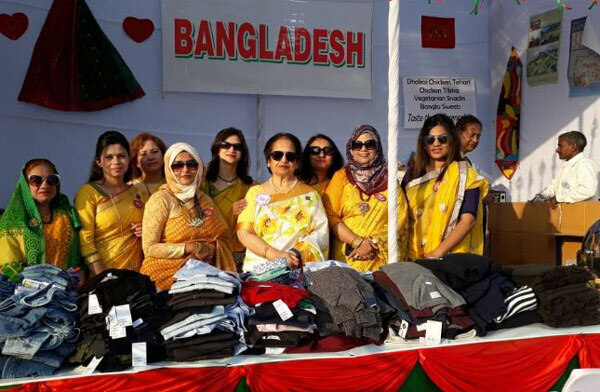 Bangladesh pavilion in the Delhi Commonwealth Women Association (DCWA) and Diplomatic Community Bazar drew huge visitors for its low-cost garment products and traditional food items. More than 30 countries participated in the fair (Bazar) with their famous products like garments, foods, chocolates and beverage items by displayed their items in more than 100 stalls set up inside the fair venue at Neheru Park in New Delhi on December 2, said the Bangladesh High Commission in New Delhi on Tuesday. The items mainly included famous Turkish, Spanish, Indian, European and Asian cuisine which attracted a large number of visitors especially from the diplomatic missions in New Delhi. Performers of different diplomatic missions displayed their cultural shows - traditional dances, fashion shows - depicting their own cultural heritages. Bangladesh High Commissioner to New Delhi Syed Muazzem Ali and his spouse Tuhfa Zaman Ali, former president of DCWA, inaugurated Bangladesh pavilion on the fair premises with the presence of the officials of the high commission and their spouses. Bangladeshi garments like shirts, sweaters, jackets, and traditional Jamdani Sarees were displayed in the Bangladesh pavilion alongside popular food items like Doi Bora, Chatpati, Chicken Tehari and different types of ‘Nakshi Pitha’. “We are participating the fair every year with Bangladeshi products and getting huge attention by the visitors as they are fond of our garments and delicious food items like pitha, chatpati and biriyani,” said Tuhfa Ali. The lion share of the sell in the fair will be donated to a charity that runs two separate schools for the differently abled persons on the outskirts of Delhi.